Brexit looms ever nearer, and we still have no certainty around what is going to happen. Will the Prime Ministers deal finally make it through Parliament? Or will Brexit be delayed? Or will we leave with the widely dreaded "no-deal" exit? No one has any idea and we now have less than 3 weeks to go until the planned exit date of 29th March! However, recent news reports suggest that UK exporters can expect to foot the bill for delivery delays to the EU. Further negative news for UK exporters, in the press this morning (Sky News amongst others). Apparently, a study by the Chartered Institute of Procurement and Supply (CIPS), around supply chains, suggests high levels of uncertainty among UK businesses, and a stronger level of preparedness for border delays among EU businesses than reported by UK counterparts. Apparently the study shows that UK exporters could expect to be punished for late completion of orders, exported to the EU. Among the finding was that for a delay of just 24 hours, 20% of EU businesses would push their UK suppliers for a discount. Furthermore, 60% of EU businesses said they would leave their UK suppliers if orders were delayed by several weeks. Supply chains are so finely balanced that even a temporary delay at the border, following the exit on 29th March 2019, will see UK businesses paid later, and paid less. The potential payment delaying effects of Brexit were highlighted in our own market research, which found that 83% of UK businesses expect late payment to increase as a result of Brexit (this includes for domestic sales within the UK, not just for exports). If you are exporting to the EU (of just selling within the UK), it's still not too late to get some protection in place, but the clock is now ticking. You could consider an export invoice finance arrangement (or the UK equivalent for domestic traders) to release the cash within your invoices immediately, even if you only wanted a temporary arrangement in place in case there is turmoil over the Brexit deadline period. That would at least protect your company against some of the possible payment delays. 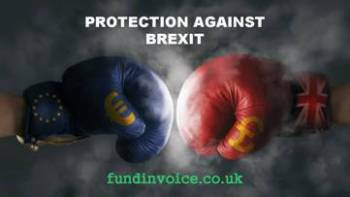 For help call Sean on 03330 113622 to discuss your export finance needs, and how you could protect your company against some of the possible effects of Brexit.